Many consumers love the sleek and modern appearance of one-piece toilets. This is because one-piece toilets compliment modern bathroom interior. Unlike two piece toilets that have a tank and bowl separate, one-piece toilets come with solid construction and just one-piece that acts as the tank, seat, and base. Moreover, many homeowners prefer one-piece toilets because they are easier to clean as they don’t feature nooks and crannies found in two-piece toilets. So, what is the best one piece toilet to buy? With most of the top manufacturing offering one-piece toilet designs, choosing a good Flushing toilet for your home can be quite challenging. So, if you’re looking for the best one-piece toilet to install in your modern bathroom, worry not as we’ve already done the research for you and came up with the 10 best one piece toilet designs on the market. We considered a number of features when choosing these toilets such as flushing power, size, comfort, height, water consumption, and eco-friendliness. I have added most popular and best selling one-piece toilet list here. The Toto Ultramax II one-piece toilet features the double cyclone flushing system that creates a centrifugal action that cleans the rim and bowl properly in just one flush. The Sleek design will automatically change any bathroom where the toilet is installed and it is very comfortable. Thanks to the ADA compliant height and elongated bowl design. Besides being beautiful and powerful, the Toto Ultramax II toilet design is very easy to clean as it has CEFIONTECT smooth glaze, which prevents dirt and other particles from sticking on the toilet bowl. This together with the tornado flush makes cleaning the toilet regularly to be a thing of the past and little chemicals are also utilized. It also uses just 1.28 gallons per flush and has its trip chrome lever on the left-hand side for public use. Kohler and Toto go head-to-head when it comes to the best toilets. 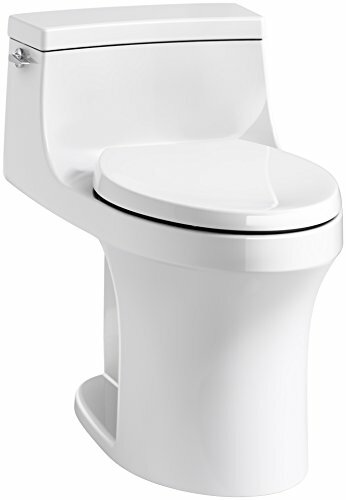 The Kohler K-5172-0 San Souci toilet is another outstanding one-piece toilet. 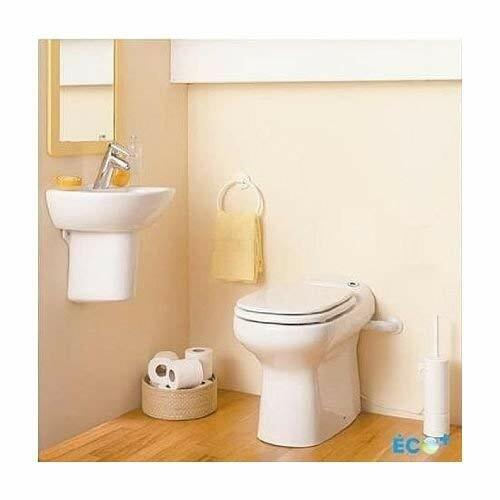 This toilet is very comfortable with its comfort height feature and it comes in a wide range of colors. Installing this toilet in your bathroom will not only change the appearance of your bathroom but as well as add a touch of elegance. 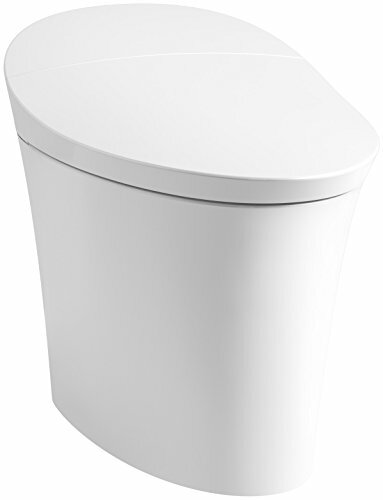 The Kohler San Souci toilet is compact in design but still with an elongated bowl. So, you can install it in a small bathroom but still enjoy the comfort of an elongated bowl design. The toilet has an innovative aqua piston flushing technology that delivers a powerful and almost plug-free flush. While doing this, it only uses 1.28 gallons of water per flush. Unlike other toilets, you won’t have leakages as it features a robust canister design with 90% less exposed seal material. 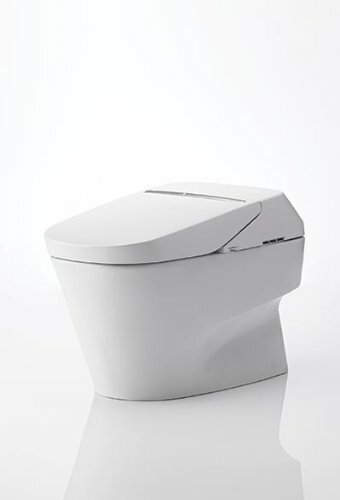 This is another amazing one-piece toilet from Toto. 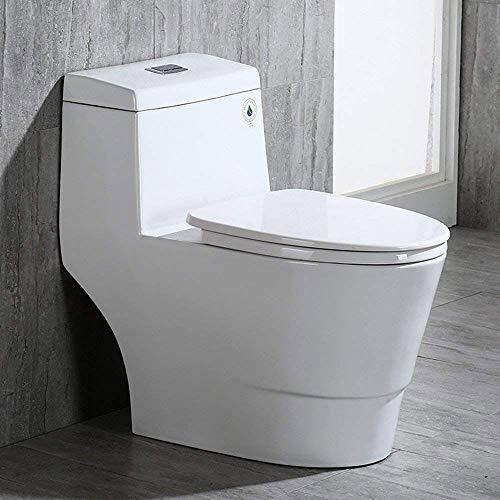 The Toto Aimes toilet is one of the best one-piece toilets for individuals who are looking for a flawlessly flushing toilet. It doesn’t make a lot of noise like some other units, and it clears the contents in just one flush. Apart from that, the Toto Aimes toilet is easy to clean both inside and outside. Inside, it features SanaGloss ceramic glaze that keeps the toilet cleaner for longer, while on the outside, it has a skirted design that eliminates the nooks and crannies that have to be cleaned. It is the best one piece toilet for the money. The Toto Aimes is also comfortable to sit or stand up as it features a universal height with a SoftClose seat that won’t create much attention after use. With its low water consumption rate of 1.28 GPF, this is a great toilet to install in your contemporary bathroom. 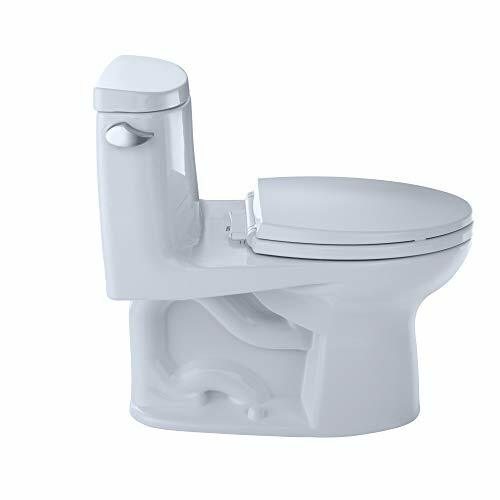 American Standard champion-4 is one of the best selling one piece toilet models on the market. 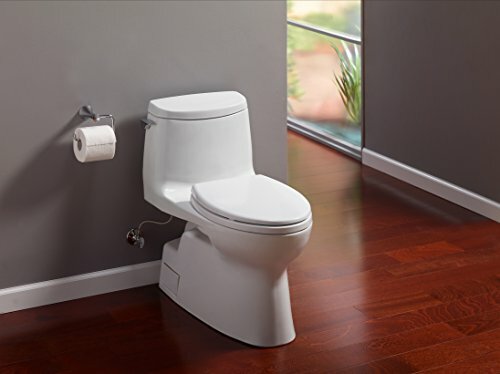 This comfortable and ADA compliant toilet features a 4-inch piston action accelerator that pushes water into the bowl 3 times quicker than a standard 2-inch flush valve. In addition, it has a large fully glazed 2-3/8-inch trapway that moves 40% larger mass than the industry standard. So, clogging will be a thing of the past. The Champion-4 one-piece toilet also has an EverClean surface on the inside and outside that prevents the growth of bacteria, mildew, and mold. As a result, cleaning is greatly minimized. With an outstanding 10-year warranty, this is a great toilet to invest your money in. The Saniflo Sanicompact self-contained toilet is the perfect one-piece toilet for homeowners looking for a compact toilet for their attic, garage, basement, ground floor, or for the upper floor. This high-performing toilet doesn’t need a tank and comes with a push button (air switch) on top of the bowl for flushing action and macerating pump cycle. The process is automatic and the flushing system is electronically timed to grant around 1 GPF of water to pass through the toilet. The compact toilet can as well as handle the effluent from both the toilet and sink. It also has a non-return valve, which is already assembled on the discharge elbow and it prevents backflow into the toilet. The Toto Washlet+ Carolina II one-piece toilet is one of the most sophisticated toilets that you will find on the market. This Washlet S350e comes with an elongated bowl design and a universal height for comfort and convenience to different users. It has Toto’s tornado flushing system that clears waste easily and only uses 1.28 GPF to-do-so. 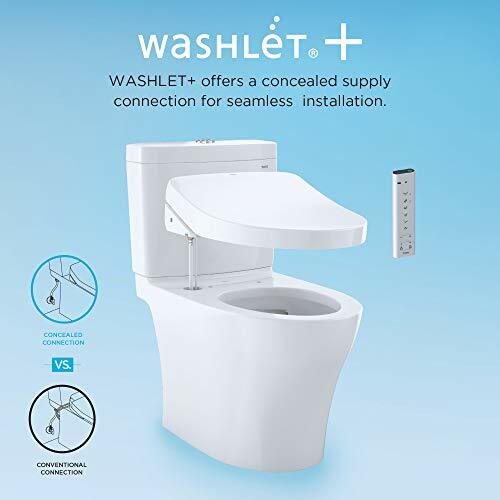 The toilet features outstanding features like Ewater+ system, CEFIONTECT smooth glaze, and the PREMIST function, to keep the toilet clean for longer. As a result, you won’t have to clean the toilet regularly. During cold evenings or season, you will have no problem visiting the toilet as it has heated seat with adjustable settings. It doesn’t come with installation items like mounting bolts, wax ring, and water supply lines. You will have to buy these separately. Considering the price of this toilet, the warranty could have been better but it only lasts for a one-year. If you want to go luxurious, the Kohler K-5401-0 will be the best toilet for you. Despite being expensive, this toilet is worth every penny as it comes with advanced features that you won’t find in your regular toilet models. For instance, this toilet features an elongated bowl with integrated cleansing. This means that you won’t need a tissue paper when you visit this toilet. In addition, it has an LCD touchscreen remote in English for operating different settings. Moreover, this high-end toilet comes with LED lighting that illuminates the bowl, thus you will have no problem identifying it. The toilet seat is heated with adjustable temperature settings. Other features that make it be exceptional include water pressure, warm air dryer function, pulsate and oscillate functions. Overall, the Veil intelligent is a great toilet for a person looking for comfort and great aesthetics in their bathroom. The Toto Neorest one-piece toilet is the most versatile toilet on our list. It is also the most expensive but worth the money. This high-quality toilet from Toto comes with double cyclone flushing mechanism for ultra-high efficiency. A partial flush uses only 0.8 GPF, while a full flush uses 1.0 GPF. This makes it also an eco-friendly toilet and it doesn’t come with a toilet tank. It is one of the most powerful best one piece toilet from Toto brand. After using this toilet, it automatically flushes making it be very hygienic. It also has a comfortable elongated bowl with a SoftClose seat that prevents slamming. When it is cold, you can turn on the heated toilet seat and be comfortable. The convenient remote allows you to change the temperature as you wish for a better experience. With these and many other features, the nearest toilet brings a new experience into the bathroom that hasn’t been seen before. WoodBridge T-0001 dual flush toilet is sleekly designed and will easily blend in any modern bathroom. This luxurious toilet comes with an elongated bowl for added comfort with a soft closing seat to prevent slamming the seat. It also has powerful flushing that clears the toilet bowl in just one flush but at the same time, it is very silent. Therefore, you won’t have clogs or leaks like in some toilets. Besides, the toilet is also easy to clean as it features a skirted design with no corners or grooves to take up your time. With a water usage rate of 1.6 GPF/1.0 GPF, you will end up saving water in the long run. The Toto Carlyle II is a nice toilet for homeowners looking for an affordable but still quality toilet to add in their bathroom. It is of a universal height and features an elongated bowl design for comfort. The tornado flushing system is very powerful and together with the CEFIONTECT glaze, they clear the waste perfectly leaving the toilet clean. On top of that, it has a soft closing seat and it is DA compliant. With its skirted design, cleaning is minimized and little chemicals will be released into the environment. 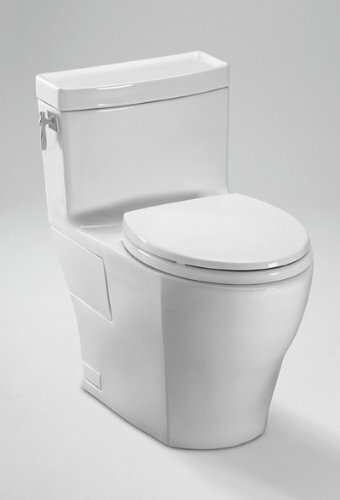 The Carlyle II is the best one piece toilet from Toto brand. The Toto Carlyle ii one-piece elongated 1.28 GPF flush toilet with CeFiONtect finish is a wonderful addition in any modern bathroom. It will immediately change the look of your bathroom and it comes with a wide range of colors to choose from. You can choose from colonial white, bone, cotton, to Sedona beige. Also, this is a one-piece toilet, thus very easy to wash. The toilet features a skirted design, which means there is less cleaning the exterior parts of the toilets as the part between the tank and bowl is hidden. Many users have complained that the SanaGloss finish doesn’t live up to its hype as marks can still be seen. Investing in a high-quality toilet can save you money and stress associated with the maintenance of low-quality toilets? So, when you go out in search of a toilet to install in your new home or to replace the old one, ensure that you pick a high-quality toilet that will last for many years to come without having to worry about clogs or breakage. One-piece toilets are the best for that matter as they are easy to maintain, sturdy, easy to clean, and very comfortable to use. The toilet models that we’ve discussed in this best one piece toilet post are worth the money and it all depends on your taste, needs, and budget. Question: What is a one-piece toilet? Answer: one-piece toilet comes with the tank and seat integrated into one unit, thus eliminating the crevice between the tank and bowl that can usually get dirty. Most upscale homes install one-piece toilets in their homes and these toilets usually have a low profile. Question: What features should I consider when buying a toilet? Answer: Before you purchase a toilet, there are various factors that you should consider and they include bowl type, toilet height, flushing system, water usage, and toilet rough-in. The best bowl design is elongated bowl as it offers more comfort, while the round bowl is great for small space. The most common rough-in is the 10-inch rough-in and it is the standard. Americans with Disabilities recommends people to install toilets with a height of between 17 to 19 inches. Standard toilet height is 14-1/2-inches. Question: How can I upgrade my toilet? Answer: One of the easiest ways of upgrading your toilet is by choosing a SoftClose seat that doesn’t slam or make noise after visiting the toilet. The Second way of upgrading your toilet is by upgrading your trip lever finish. Most trip levers come in chrome plated finish. Instead, you can change it to another finish in order to match your towel bars or faucet. Still, have a question after reading this best one piece toilet reviews? Comment below.